When you watch TV next to a foreign exchange student from Paris who has been entrusted to your care for a month, you become acutely aware of how often Americans poke fun at the French. It’s a little awkward to be in a position to explain those jokes. Our eldest, Oscar, is taking honors French classes in high school. This Spring he brought home a letter asking families to volunteer to host an exchange student for the month of April. We’ve had several friends live with us for about that amount of time while they were in transition, and we name hospitality as a key value for our family, so we stepped forward. We didn’t anticipate that we’d learn as much about ourselves as our student learned about Midwestern America. 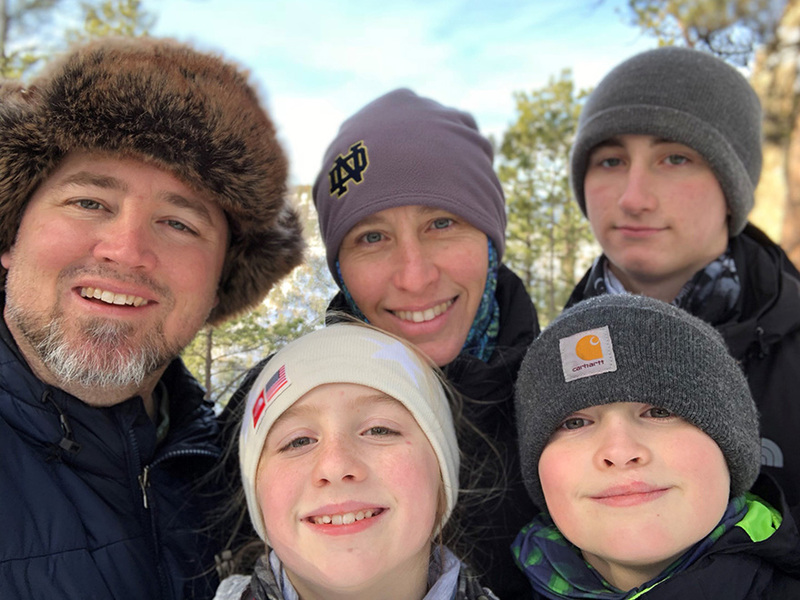 The program that made the connection for us, Inspired Gateways, has a mission to place Catholic students from France with Catholic families in the US. That mission helped us see the experience as an encounter with the universal Church. It put us at ease to know that, at least on a very basic level, we’d share common values and beliefs with whomever came to visit us. 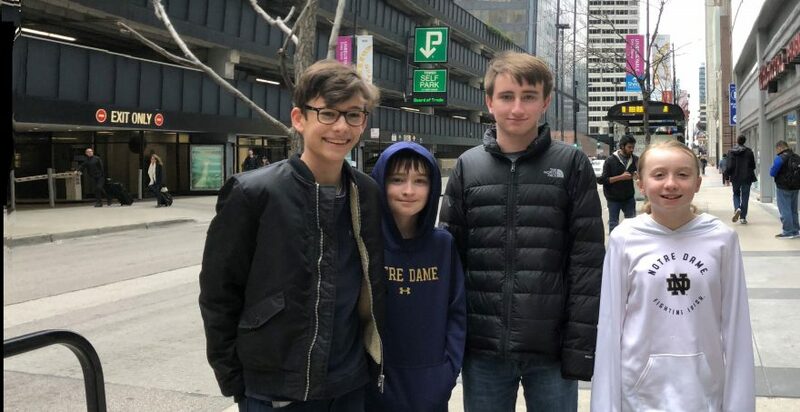 When we received information about our student—a 15-year-old boy named Octave—we learned he was interested in fantasy novels, which was the first clue that he was going to get along with our family just fine. He arrived speaking very good English and with a curiosity about our values and patterns of life. He went to school with Oscar every day but had his own class schedule—he seemed to fit in to the school very smoothly. We made a point of helping him experience slices of American life, staying active on the weekends and sharing our family life with him. We took a trip to Chicago to see some of the city and to take in the famous Shedd Aquarium (Octave has an interest in aquariums and even built his own at home). We explained the game of baseball to him and took him to a game and even played whiffle ball home run derby in the front yard. We watched movies and TV together, and played a lot of games—most of which he won. He’s a smart kid. Having him with us for a month helped us to see our lives more intentionally—we suddenly had the opportunity to examine what we do and why, which was a gift. It also opened our eyes to what is unique about our lives here in northern Indiana—things that are very easy to take for granted, such as the arrival of Spring (it was snowing when he arrived, and tulips were blooming when he left). Our children learned that schoolwork, chores, jokes, good books, and teasing are all common human experiences, no matter your culture. Beyond the benefits of the cultural exchange for our family, we place a high value on hospitality. It’s an important way in which we understand ourselves, and we consciously practice it with our kids. When we welcome dinner guests, for example, we talk about how the evening will go and what the kids can expect. We invite the kids to sit with us to socialize and have a soda before the meal while the adults enjoy conversation and a glass of wine with some cheese and meats. When our kids are older, and perhaps have families of their own, we hope they’ll look back at what defined our family life and remember our hospitality. Welcoming a young Catholic student from a different country will be one more example of that value for us. And our hope for an encounter with the universal Church was fulfilled. When France won the World Cup, for example, it was fun to reach out and share some joy with him—Allez Les Bleus!—and to receive a photo of him celebrating with Parisians at the Arc de Triomphe. We had no incredible spiritual breakthroughs with Octave, but we did go to Mass every Sunday and included him in our night prayers. The lasting impression we have is simply sharing our lives with part of the Body of Christ from a different culture—we feel connected to Catholics in France in a new way, and that has enriched our sense of belonging to the Church.